20 cool and stylish saafas for the groom and his baraatis! Wedding trousseau of a groom is incomplete without a beautiful saafa on his head. Even the baraatis tie a beautiful pagdi round their head. Its said that a saafa holds a man’s respect and something that owns such a great position cannot be ignored when it comes to your wedding! So grooms, let me ask you something, wouldn’t it be just perfect if this trousseau crown could be as trendy as your sherwani? Well, worry not! We have your back as always! Keep scrolling to fill your idea buckets with our collection of trendy saafas that are hitting hard this wedding season! 1.The rainbow coloured saafa for the groom and his squad! 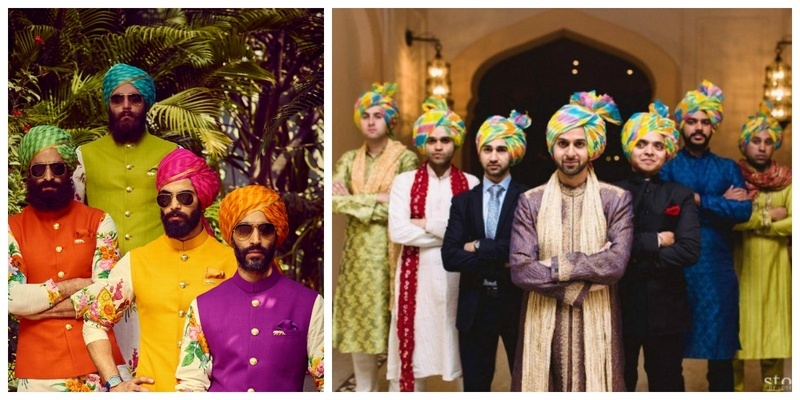 This groom and his baraati squad opted for a trendy cotton rainbow coloured safa and we just couldn’t agree more with this offbeat choice of theirs! 3. Dual Tone Saafa for our dapper groom! I'm not a great fan of groom trousseau, but seeing this dual coloured classy saafa, I'm going to add this one to my list of favourites. The plain off white chanderi silk safa is paired with a classy brown coloured satin silk based cloth with criss-cross pattern embroidery over it! 4. Boho print rayon safa for the baraat brigade! Amitabh Bachchan, along with son Junior bachchan is giving our grooms and their baraatis major trend goals. The cotton safa with Boho print is elegantly wrapped around the neck throwing out style vibes! Abhishek bachchan and his cool friends made a trendy batati squad by sporting beautiful chiffon safa. The floral prints make this choice of pagdis quite trendy and offbeat. The brocade border at the bottom gives it an added elegance. 6. Chanderi silk safa for this cricketer groom! Virat Kohli broke a million hearts by getting married in a beautiful wedding ceremony held at Tuscany, Italy. He chose a chanderi silk safa with golden emergency embellishments at its border and accessorised it with a beautiful feather brooch. This groom eschewed all fancy ornaments and colours for his safa, and opted for one made with a metallic copper gold Charmeuse fabric instead. It paired perfectly with his minimalist white sherwani that also had no added accents or motifs over it. This dapper groom wore an offbeat printed rayon silk safa that was beautifully coordinated with the sateen silk stole. Simply loved the choice of crinkle beige coloured safa of this groom. The offbeat brooch and layered pearls makes the groom’s trousseau complete! 10. Colour coordinated safa for the groom and multicoloured safa for the baraatis! This baraat squad of the groom was captured in a chivalrous shot with the dapper groom in the middle. The groom went for a traditional haryana style wrapped safa and the multicoloured pagdis were for the happening baraatis. 11. Bandhni saafa for this Handsome marathi groom! This handsome groom opted for a subtle cotton safa for his traditional Marathi wedding. The bandhani printed safa was the perfect choice for this traditional wedding ceremony. This one definitely does justice to the golden zari sherwani of the handsome groom. The cotton silk safa has an unexplainable grace and the gorgeous brooch exceeds the elegance manifolds. Talk about having fun with mix n match of colours. This velvet safa groom coordinated his pagdi with the colour of the bride's wedding lehenga. It has a beautiful red brooch over it and the pag has a silver hota border all over it. The layered traditional pearls make this fall in the list of the most offbeat safa that we spotted. This groom smartly coordinated his safa with his sherwani as well as with the bride's wedding trousseau! The beige coloured cotton safa is perfectly in match with the bridal lehenga. And on top of it, the emerald stone on the brooch with layers of bead is in a great coordination with the groom's sherwani. 15. Metallic silk safa for the elegant ones! Metallic coloured silk safas are the newly introduced trend and being featured by Sabyasachi, there is no need to explain the element of elegance in it. The groom's choice for a golden beige safa was the perfect one as the colour perfectly blended with that of the bridal wear. The zari fabric based pagdi looks radiant if you ask me. 17. Traditional leheriya pattern on bright colours modern safa! What a modern and colourful style to show up at your friends wedding! This leheriya pattern chiffon safa with golden border is the perfect attire to go for to rock at your #YaarKiShaadi. This groom opted for a red coloured safa again coordinating perfectly with the bridal trousseau. The traditional print all over it gives it a holistic touch. Having a knack for handlooms, I simply adore this sophisticated and sober cotton off-white safa of the groom. It features the work of golden criss-cross pattern all over it. 20. Polka Dot saafa for the groom and pastel pink safa for the bro squad! This groom in the middle perfectly blended his choice of pagdi with his beloved friends with a slight hint of uniqueness. The golden thread embroidery and the hota work on the border makes it simple and classy. For the happening baratis the pagdi has been chosen slightly different as it has white thread very light embroidery over it. So, have you decided the saafa to go for that suits your personality the best?